Riding along the cycle route that runs diagonally through Copenhagen and Frederiksberg, gives you the same feeling as seeing a city from a train. You get a glimpse of its private life. The Nørrebro route offers surprising insights into what lies behind the façade of Copenhagen. Maybe it isn’t really all that remarkable – the route runs along an old railway route through Frederiksberg. The trains now run underground as part of the Metro. Elsewhere, the route runs past trees so tall that the city feels far away, even though you’re in the heart of the capital. You pass several parks and activity areas on the way. Although the bike path is mainly used by commuters, it’s a popular destination for outings as well. The route is almost 10 kilometres long and runs from Lyngbyvej in the north to Valby in the south. The Frederiksberg section is called the Green Path, but the name is equally apposite for much of the route. It runs past back gardens, parks, allotments and housing blocks, and new things to see and do emerge all the time, including the Superkilen park and activity area with its Red Square in Nørrebro, the bike and pedestrian bridge over Åboulevarden, and the green, undulating landscape of the campus at Copenhagen Business School. The vast majority of the route is on actual cycle paths, but at some points the path runs alongside roads and traffic. Pedestrians are allowed to use the route too, and there are plenty of benches long the way. 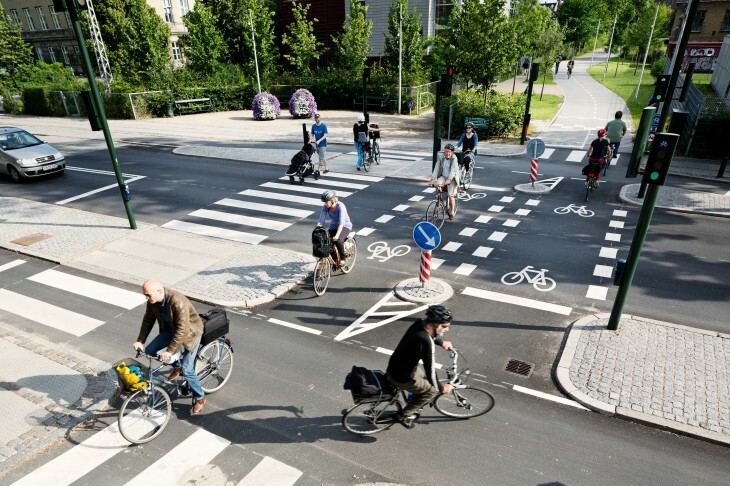 At total of 40 kilometres of green routes run through Copenhagen; the Nørrebro route is just one of them. The plan is for 110 kilometres of cycle routes through green areas within the next decade. Playgrounds (Nørrebro Park and Superkilen have a particularly wide range of options. There is also a small playground near the Frederiksberg Centre). The Nørrebro Route started out as a pilot project in 2008. Since then, it has served as a model for several other green cycle routes. In 2013, the Nørrebro Route was awarded the Town Planning Prize, which Copenhagen has only won twice before. The route mostly runs through parkland, much of which features large trees and numerous birds. Flowers, grass and flowering bushes. If you are up and about early, you may spot foxes, particularly in the northern section. The route passes through areas with cafés and restaurants. Plenty of picnic spots and barbecue areas in the parks along the way, e.g. at Hillerødgade in Nørrebro Park.